Purchase 50 or more Celox Haemostatic Agent Single Sachet - 15gs and download your free support pack worth £100. 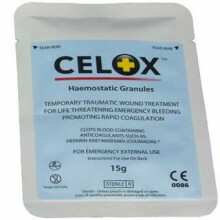 Purchase 200 or more Celox Haemostatic Agent Single Sachet - 15gs and you can have personalised covers absolutely free! CELOX is the newest generation of emergency haemostatic agents. Simple to use, CELOX granules quickly control even the most severe arterial bleeding. Just pour it in, pack it, and apply pressure. CELOX is not exothermic and will not burn the victim or caregiver. 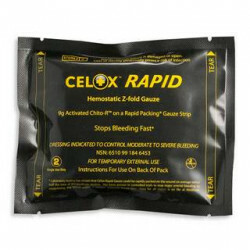 CELOX works in hypothermic conditions and clots blood containing anti-coagulants. CELOX is safe to use for the entire body including head, neck and chest wounds. Most importantly, CELOX can be used instantly and without hesitation as a fast, safe and simple emergency treatment for serious bleeding.